THE LUAS RED Line has reopened following the death of a woman who was struck by a Luas tram this morning. Gardaí are investigating the incident, which occurred between the Cookstown and Tallaght Hospital Luas stops at approximately 10am. Luas suspended a number of services between the Red Cow and Tallaght/Saggart following the incident. Delays are still expected until approximately 4.30pm. 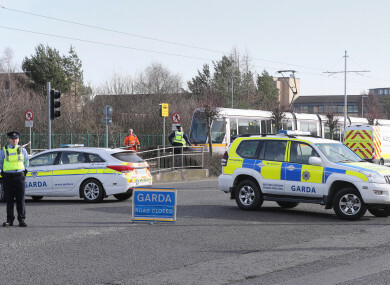 Gardaí are looking to speak to anyone who may have witnessed the incident – including people on the tram at the time, witnesses who were on the Cookstown Way or any motorist who may have dash cam footage – to contact Tallaght Garda Station on 01 666 6000, the Garda Confidential Line on 1800 666 111 or any garda station. Email “Luas Red Line reopens following death of woman in Tallaght”. Feedback on “Luas Red Line reopens following death of woman in Tallaght”.